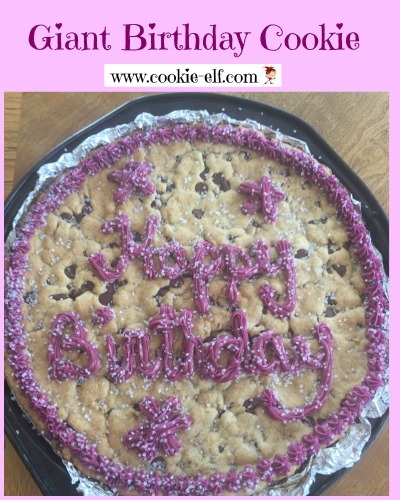 Giant Birthday Cookie Recipe: More Fun Than Birthday Cake and Easier Too! More Fun Than Birthday Cake and Easier, Too! Make a Giant Birthday Cookie and make your birthday girl or birthday boy (or any age) happy! Let’s be honest: homemade is more personal than store-bought. A giant cookie is easier to make than a birthday cake. And who doesn’t like cookies? So says The Cookie Elf. GRIN. And if you’re worried about the time you may need to decorate, worry no more. You can use a tube of prepared cookie icing. Save what you don’t use and pop it in the freezer until the next birthday in your family. Preheat oven to 325º F. Line a round pizza pan with aluminum foil or parchment paper. Spray lining with vegetable spray. Combine flour and baking soda in a medium bowl. Set aside. In a separate bowl, using an electric mixer on medium speed, cream butter and sugars until light and fluffy, scraping the bowl continually about 2 to 3 minutes. Beat in egg and vanilla until creamy, about 1 minute. Gradually stir flour mixture into creamed mixture a bit at a time until well mixed, about 2 to 3 minutes. The dough will be thick. Stir in chocolate chips by hand. Drop dollops of cookie dough onto prepared pan and use lightly moistened fingers to press out dough evenly so that it is well-distributed in the pan. Bake cookie 15-20 minutes until edges just begin to brown very slightly. Do not over bake. Remove baking pan from the oven. Allow cookie to cool completely. Use decorating cookie icing to decorate edge of cookie and write “Happy Birthday” on the center of the cookie. To serve, cut cookie with a sharp knife or a pizza cutter. Lift out pieces with a spatula. You can sprinkle cookie dough surface or icing with cookie sprinkles for extra color. To personalize the cookie, add the birthday honoree’s name with icing in his/her favorite color. More giant cookie ideas on our Jumbo Cookies Pinterest board.